Scroll down the page for the most recent posts. Another busy start-of-year, and once again we're well into it before I get around to wishing everybody a Happy New Year! Debbie and I have already both had our birthdays and it's only a few weeks till our wedding anniversary. If I have my calculations right this will be our 18th. Apparently that's "porcelain", which is not really something we need much of in our house: too many clumsy birds, cats, dogs... and people for that to work! So if you were thinking of a present, why not go with cake, instead. Debbie, looking beautiful as ever. January: Wedding of the year - Debbie and Mart. Our friends Debbie and Mart got married in January. It was a fantastic big event in a fairytale castle, and as Debbie was a bride'smaid we got to stay in a super dooper four-poster room which meant we could get the full benefit of the whole day of the wedding. I got to meet some of Debbie's friends for the first time, which was nice, and I spent the day taking some video for Debbie and Mart and a few snapshots for fun. I've put some pictures on Facebook in case anyone is interested, and when I eventually get my web pages updated and upgraded I'll put some on here, too. I got a couple of photos that I really like. Here on the left is one of my favourites of Debbie all polished up in her bride's maid's outfit. Here on the right is another of my favourites from the day. I think I might try and do more Black and White candid stuff when I grow up. Debbie still painting horses... and cats! Debbie's artistic talents, and output, continue to multiply. She has just completed this new picture of Morse, one of the horses from the yard at Keele where Meg lives, and she is now starting to take on commissions! She did a few pictures for friends, and now their friends want pictures. Perhaps we'll get rich after all! Debbie is just starting work on a cat for a friend of a friend... she's never done a cat before, I don't think, so watch this space. Reading: Proust, Kerouac and Captain Scott. I have been a little better at finding time to do some reading, which is a good job since I have embarked again, with a litttle more success than previously, on Proust. Encore une fois a la recherche...Unfortunately, given how long this is likely to take, I have also just taken delivery of several other books I've been waiting to get my hands on, including the Folio Society editions of Kerouac's "On The Road" and Captain Scott's Journals. With some rather more lightweight Alexander McCall Smith and some others also waiting in the wings, there's plenty in the pile. And then there's all that weight to be lost (Fat Charlie the Archangel keeps going around in my head!). Well I have no opinion about that. Work is feeling a bit like hard work at the moment, but I guess that's what they pay me for. If students were always a joy to teach and colleagues always a joy to work with, where would be the fun in that, eh? There are plenty of good things going on too: the Inspirational Landscapes work continues to throw up interesting diversions, and in the last couple of weeks I've had both a sculptor and a photographer working on interesting things in the Low Temperature lab. Thanks to Simon Cook for introducing me to both of them. Here's Miriam's web site, and here's Oliver's. I've signed up for a staff development course that will earn me a Certificate (or a Diploma, or something) in External Examining, and I am making slow, slow progress on a couple of book-editing projects. So slow in fact that progress may be too strong a word. I know I've done this sort of thing before but, well, I'm doing it again! I've just started a WordPress blog, where I can write stuff that certainly doesn't belong in these updates but that I want to put somewhere. I don't think it will be of interest to anyone but me, but if you are curious you can find it here. Work continues to throw up interesting little moments. I currently have three sections of a large sculpture made out of feathers and covered in bubblewrap chilling at -30 degrees in the cold room to eliminate the risk of mites prior to exhibition. Outside of work interesting little things are appearing as well. I have a new relative: Lyla Skye Mcleod. Welcome on board. Good luck! Rather like Christmas, Easter is a time of year when we stuggle through a very busy period immediately beforehand and we're really ready for the Easter vacation when it arrives, taking a few days completely off, as far as possible, to get our breath back. Having said that, our holiday days are far from quiet. At this time of year we set the alarm for 6.40am to get a good start and make the most of the day, and this morning spent two hours helping to round up a stray calf (I've never seen a cow in the back of a car before) before having a very successful birding dog walk trip to Berry Hill where we had our first ever sighting of a Ring Ouzel (a fairly unusual bird), followed by a quick update of the website to get the blurry photo up before lunch. Debbie has been busy with her painting, and has eaned her first commissions, which I guess makes her a professional artist now! Here's her latest and greatest: Gus in oils. I'm not quite sure how she fits it in between looking after all the animals: we had a trip to the vet with one of the doves a couple of weeks ago, and dove-maintenance has been stepped up ever since. We also went to see Jack and Emily in their High School Musical (literally), and had Debbie's Mum to stay for a few days. I am trying really hard to have a few days not doing any academic work, but I'm not being completely successful! I've tried distractions as diverse as Proust (I've progressed into vol.2), the model railway (moved up to the loft but in the early stage of rebuilding), Bill Bryson ("Down Under"), sorting out the garden (but the weather's too rubbish for that), and joining Debbie in a lot of Horsey, Doggy, Birdy things, but it does take a few days to get academic stuff out of your head. Clearly I need a longer holiday! ...and voila, by mid April the weather has turned around and having had a few days back at work I'm now enjoying a very sunny weekend without even any jet trails in the sky, thanks to UK air space being closed because of the Icelanding eruption. It really makes a difference having no jet trails: it's very noticable here. So it's lawn mowing, tree pruning, pond repairing weather now. I've even fixed a latch onto the garden gate. That's only taken, what, ten years? Well, it's a big decision, drilling into the outside of your house! Also I've been starting to put together my new Inspirational landscapes web site and have been making some little greetings cards (so if you get something through the post you'll know what it is!). Gadgets gadgets... I wanted a radio remote control for the camera so I could leave it by the birdfeeders and trigger it from afar when birdies appeared. Looked online and the "proper" remote control cost something like £300! Forget that. So there's a Chinese import claims to do the same job for £20. Hmmm... I'm normally very sceptical about deals that seem to good to be true, but reviews on Amazon were positive so I thought for the risk of £20 and the saving of nearly 300 I'd try it. Hey presto, a remote control. As you can see from my first attempt on the left I need a bit of practice with the exposure, but it certainly lets you get the camera close to the birds without scaring them! The only problem is the chinese instructions, which read: "when the use of group racket function, need transmitter's digit code switch to establish completely only as 1234, then all receivers implements the active control to the region, realizes to camera focusing, the shutter and the B mode control". Ah, yes, indeed. October: long time no see! Well, so long has passed it hardly seems worth trying to catch up, and there's too much serious stuff in that six months anyway, so let's fast forward to now. 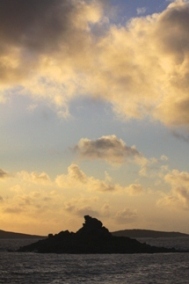 Debbie and I just had our annual trip to Scilly, and now we're both back at work and into winter-running. I've been on a short break from Proust, but I'm ready to jump back in when I finish my current bedtime reading which is Steinbeck's "Travels with Charley in search of America", of which I recently acquired a nice Folio Society edition. Bathtime music continues to be Dire Straits and Paul Simon: why break the habit of decades? I've also started to show signs of graduating from Mahler 6 to Mahler 9. I'm not sure if that's a good sign. Captain Oates was very ill late in the summer, and is still poorly after an extended series of tests and remedies. It looks like she might be needing extra care for the indefinite future: special food, medicine, etc. She has good days and bad days at the moment, so we're just keeping on top of it with her. Gus, meanwhile, appears to have nothing physically wrong with him, and his appetite remains undiminished. His appearance remains unimproved. 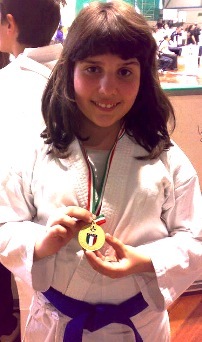 We had some exciting news from Debbie's Italian relatives this week: Congratulations to Chiara Gargiuli on becoming Italian under-11 Karate Champion! Perhaps we'll be seeing an Olympic champion in the family soon... Thank you to Tarquinio for the photo. I think I can see a little bit of a family resemblance with Debbie here. Debbie has started making plans for a visit to go and see the family in Rome, and is starting to learn Italian in preparation. It isn't going quickly, but I'm sure she'll get there: "Ciao. Mi Chiamo Debbie. Posso avere the potatoes?" We didn't actually "do" Christmas this year: it's the first year ever that we didn't have a tree or lights. I didn't even manage to send any Christmas cards, although I think Debbie got a couple out. We were somewhat overwhelmed by all sorts of stuff in the seond half of the year and as Christmas approached, so we didn't do a great job. But anyway, here we are drawing to the close of another year and once again it seems to have got the better of us in the last few months... which is becoming something of a recurring theme in these letters! Years ago I wrote a short story in which I said that diaries are limited (like our range of vision between red and violet) and that we often choose not to include the most important things. This year I blogged a little bit about where we might put those things that we can't face. Certainly not here. On the plus side we do have a couple of new characters in the house: a little while after Captain Oates went to Cat Heaven we rescued two young cats (perhaps not exactly "kittens", but in that direction) from Cats Protection. Genghis Cooper (aka The Cat with No Name) and Mugly (aka The Invisible Cat) settled in remarkably quickly, and within just a couple of weeks were good friends with the older cats. Now, after just a month, they are totally integrated: all playing, eating and sleeping together happily. Of course the new cats took to Gus without a moment's thought, so there was no worry there!